, of Ferrara, an artist born in 1532, was nicknamed Gratella by his countrymen, because he was the first who introduced the method of squaring large pictures, in order to reduce them with exactness to smaller proportions, which the Italians call graticolare, a method which he had learned from Michel Angelo, whose scholar he was at Rome, though unknown to Vasari, at least not mentioned in his life. He was the son of Camillo Filippi, who died in 1574, an artist of uncertain school, but who painted in a neat and limpid manner and if we may judge from a half-figure of S. Paul, in an Annunziata of his in S. Maria in Vado, not without some aim at the style of Michel Angelo. 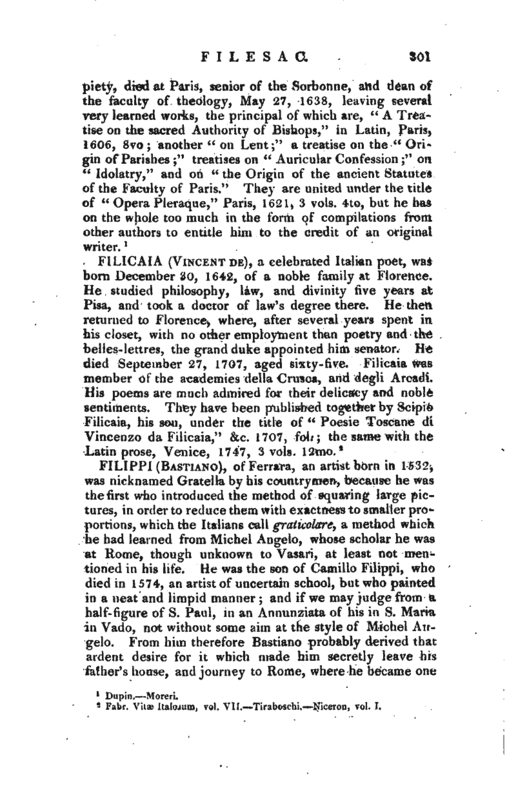 From him therefore Bastiano probably derived that ardent desire for it which made him secretly leave his father’s house, and journey to Rome, where he became one | of the most indefatigable copyists and dearest pupils of Buonarotti. What powers he acquired is evident from the “Universal Judgment,” which he painted in three years, in the hoir of the metropolitan a work nearer to Michel Angelothau what can be produced by the whole Florentine school. It possesses grandeur of design with great variety of imagery, well disposed groupes, and repose for the eye. It appears incredible that in a subject pre-occupied by Buonarotti, Filippi should have been able to appear so novel and so grand. 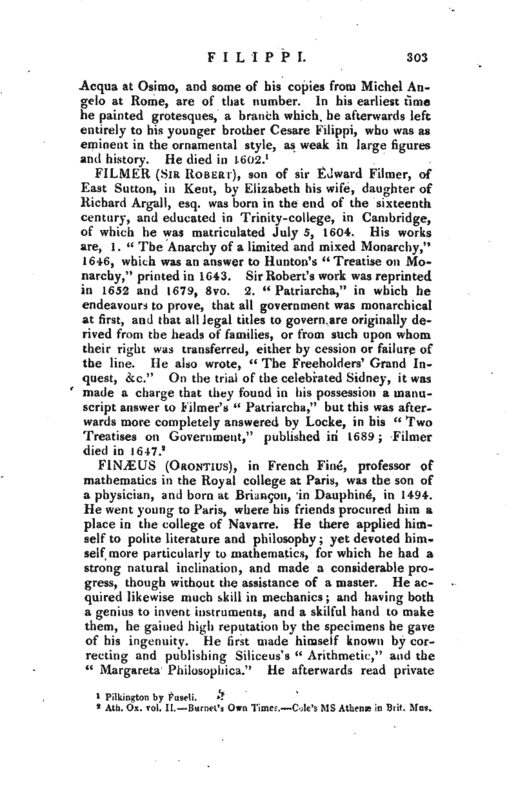 He imitated the genius, but disdained to transcribe the figures of his model. He too, like Dante and Michel Angelo, made use of that opportunity to gratify his affections or animosities, by placing his friends among the elect, and his enemies with*the rejected. In that hapless host he painted the faithless mistress who had renounced his nuptials, and drew among the blessed another whom he had married in her place, casting a look of insult on her rival. At present it is not easy to decide on the propriety or intemperance of BaruiTaldi and other Ferrarese writers, who prefer this painting to that of the Sistina, for decorum and colour, because it has been long retouched; and already made Barotti, in his description of Ferrarese pictures, lament " that the figures which formerly appeared living flesh, now seem to be of wood. 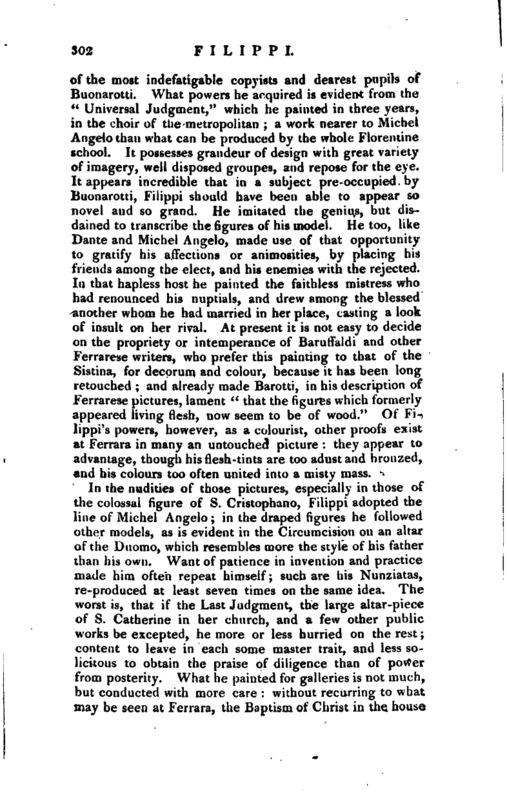 7 ' Of Filippi’s powers, however, as a colourist, other proofs exist at Ferrara in many an untouched picture: they appear to advantage, though his flesh-tints are too adust and bronzed, end his colours too often united into a misty mass.